These open topped Falafel, Avocado and Sweet Potato Pittas with Chilli and Lime Mayo are the perfect addition to any picnic. 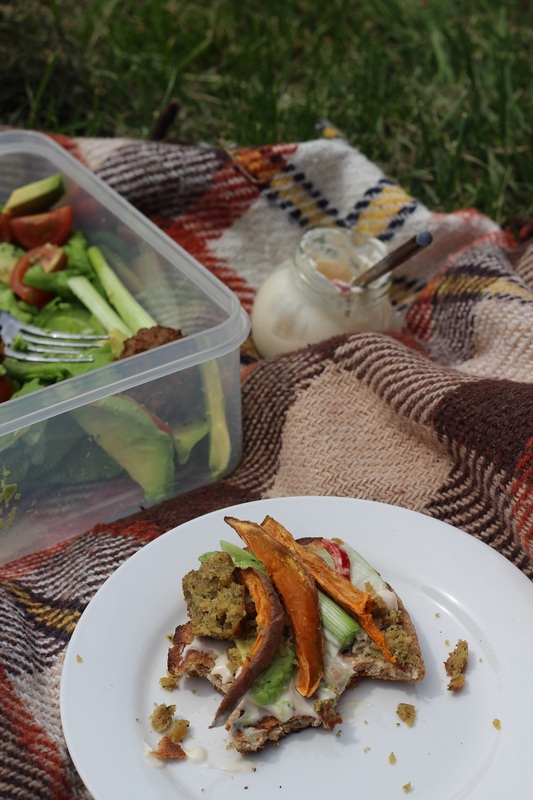 Simply pack the pitta, mayonnaise, avocado and sweet potato slices and let everyone build their own open sandwiches in the sunshine. One of the things I love the most about the summer is being able to eat alfresco. Whether its sat on the terrace of a taverna on holiday, the balcony of your flat, fish and chips on a beach or a picnic in a park. Picnic’s are perhaps my favourite way to eat al fresco – wandering through fields and woods, with a woollen picnic blanket and wicker basket is such a romantic notion to me. It’s one of my favourite ways to spend time with Jon in the summer eating tasty food, and relaxing somewhere peaceful. We are lucky that we have lots of different parks to choose from around Southgate. From Trent Park in Cockfosters to Grovelands Park on the edge of Winchmore Hill. 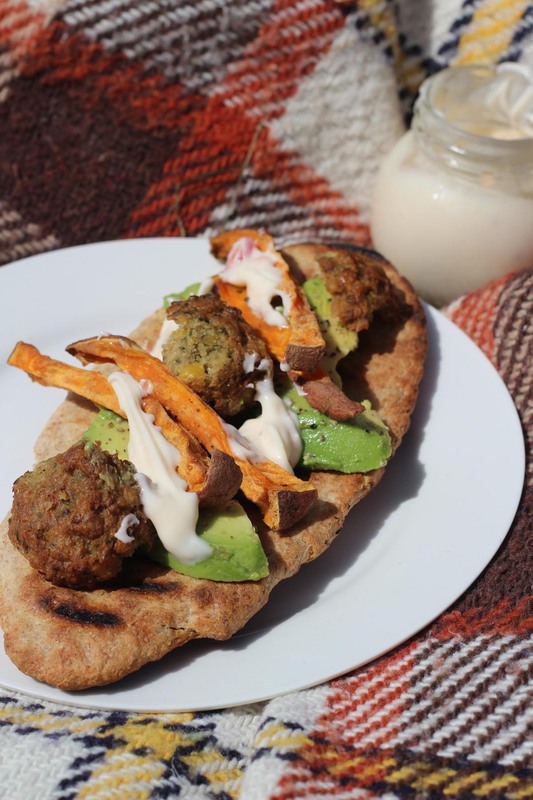 We devoured these Falafel, Avocado and Sweet Potato Pittas with Chilli and Lime Mayo one weekend exploring Hampstead Heath. We packed them along with a tomato salad and plenty of fruit to enjoy for afters. The combination of spicy falafel, soft and cool avocado, with sweet potato, and rich chilli and lime mayonnaise is the perfect way to top the humble pitta. Slice or dice the sweet potato and place into a hot oven at gas mark 6 for 30 minutes with a drizzle of oil and plenty of salt and pepper. While the sweet potato is cooking, begin to prepare the mayonnaise. Place the egg yolk in a bowl along with 1 tsp of the lime juice. Whisk until combined before adding a very small amount of the oil and ensuring it is well blended. Keep adding a little oil at a time and whisk thoroughly each time a little more is added until the mayonnaise has emulsified and become thick. The mayonnaise should be a little to thick to pour or drizzle. Stir in the remaining lime juice to loosen the mayonnaise and stir in the fresh chilli, diced finely. Once the sweet potato has become soft, place to one side and allow to cool. When ready to eat, grill the pitta breads under a high heat. Thinly slice the avocado and lay on the pitta breads. Top with the sweet potato and lashings of the lime and chilli mayonnaise. I love the way you can build these pittas exactly to your liking. Each of the individual elements travels really well so you can pack them all away in a picnic basket and build them before you eat. We used a teeny tiny jam jar to transport the mayonnaise but any small tupperware would do! I’m always taking weird and wonderful dishes to picnics which does create some logistical issues. 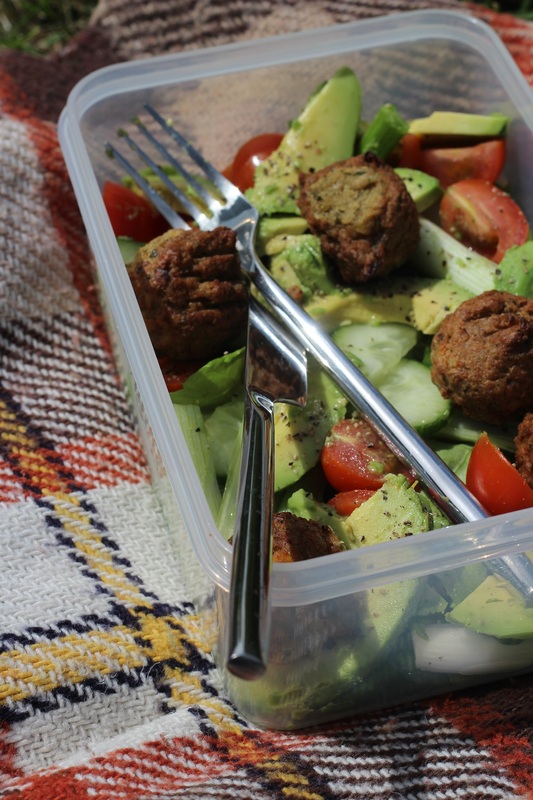 We actually have a boater picnic hamper for four people so that we can carry all of our picnic necessities – large salads, plenty of fruit, pastries, sandwiches, and even more salads! I’m also a big fan of taking a bottle of bubbles (both alcoholic and non-alcoholic) to enjoy in the sunshine. With so much food, picnics for me are more than just sustenance on a sunny afternoon walk. They are the main event! As we wandered around Hampstead Heath it took us a good half an hour before we found our perfect picnic spot. We were right near a lake, which brought with it the gentle sound of running water. We were slightly up a hill too which meant we could do a spot of people watching as dog walkers, families and couples wandered along the path below. When we finally finished our lunch we lay there looking up at the sky spotting all sorts of weird and wonderful shapes in the clouds. Seriously – what’s not to love about picnics?! What’s your favourite way to eat al fresco? I love different picnic ideas, there is something about eating outdoors that is just so fun! These look very tasty! Thanks Isabella me too! So many options for picnics. Secretly pork pies are my favourite but these are awesome! Mmmm, I love the look of these pittas, they sounds really tasty and I bet they are a really healthy picnic option too! I’m never good at thinking of food for picnics so might just have to make these for our next one. Kids will love them (maybe without the chilli though) too. Your post makes me want to picnic right now ! Mmm, this looks exactly my kind of lunch. LOVE sweet potato and this looks a gorgeous way to enjoy it in the sun. Thanks Emily! I’m a big fan of sweet potato too. It was nice having it in a form other than chips or mash!